Recorded at the Mark Time Radio Show at CONvergence, 2005. "These performances were a lot of fun. 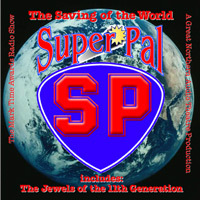 I loved the documentary-style interviews in telling the tale of Super Pal, and the jokes in Jewels made me laugh out loud a couple of times! Very witty, and hearing the audience respond now and then in the background really made it all the more enjoyable. For a live performance, it has a better sound than a lot of in-studio performances. A very enjoyable hour!"